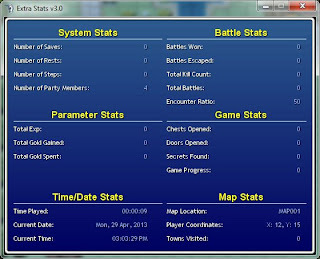 The Extra Stats Script displays a new window containing extra in-game statistics, such as number of battles won, number of chests opened and amount of cumulative gold collected. An RMVXA version is also available. Version 4.0 is complete and is available for download. Version 3.0 is still available for anyone preferring it. The script was originally a part of the RMVX Scripts/Add-Ons Compendium (no longer supported), which was a collection of basic scripts and scriptlets I’d written. This was subsequently absorbed into the Q-Engine. In fact, the Q-Engine developed out of the Compendium and eventually expanded to include other enhancements and features. However, it was eventually integrated into the Q-Engine, but was later extracted again as a separate script when additional stats were appended to it. This was actually one of the very first scripts I started writing. It began life in RMXP, where I wanted the "Play Time" and "Steps Taken" windows to be integrated into a single window rather than separate ones. 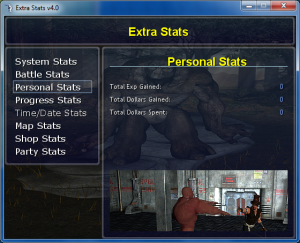 The original Extra Stats script was designed specifically for The Gladiator Project (currently under development for RMVX on hold), then an embryo in RMXP before being ported to RMVX. The Extra Stats window can be called from the map, as well as being integrated with the main menu (Menu Status) by pressing a predefined key. Both options can be togged on/off so you can have the option to display the window from just the main menu or just the map, or both. Here’s a screenshot to demonstrate what it looks like in the game. The updated manual will be uploaded soon. A full demo will be made available as soon as I have time. Version 4.0 has now been released. It includes a menu system that allows you to view sections individually, which gives it a better scope for future expansion as and when new stats are added. Its reliability on the Universal Configuration Settings Module has been completely unlinked and instead uses the settings in the script itself. Version 5.0 (the final version) will be produced eventually.